Veeam Availability Suite v8 has been released and customers and partners are already upgrading their environments and exploring the several new features that have been added to this latest version of the software. Luca was nice enough to ask my opinion about some gems in Veeam Backup & Replication V8 related to Hyper-V. Gem #8 is all about how Veeam makes what would otherwise be complex and challenging data protection scenarios in Hyper-V really easy. One of the hallmarks of virtualization is the pooling and allocation of resources on an as needed basis to the virtual machines or applications who need them. A resource pool represents one of the key tenets of virtualization and also one of the biggest challenges when it comes to data protection. Veeam Backup & Replication V8 now provides direct support for the backup and recovery of data stored in a Hyper-V resource pool. When you backup data in a resource pool Veeam Backup & Replication will create a marker for the location of the data within the resource pool. When it is time for recovery if the data is to be restored to its original location then the markers will be used to reestablish the data in its original location in the resource pool. If the data is to be restored to a different location then the markers can be discarded and the data recovered without incident to a new location. One of the coolest new features to come from Hyper-V in Windows Server 2012 R2 is the ability to use a shared vhdx file and build a cluster of virtual machines around this shared vhdx file. Before shared vhdx the only options for clustering in Hyper-V were to build guest clusters in Hyper-V, which did not have any true shared resources, or to cluster the Hyper-V host machines. Clustering Hyper-V hosts feels like a hold over from the days of client server and physical hardware dependence. There is a shared physical hard drive and true high availability (HA) is achieved by defining the nodes and resources in a working failover cluster using Windows Server 2012 R2’s Cluster Manager and Cluster Verification tools. There is no capacity in this scenario to rely on, or make use of, resource pools, or the benefits of scalability and elasticity that are so desirable in virtual/cloud infrastructure designs. Shared vhdx files give the Hyper-V administrator the option to build a true HA cluster entirely of components that are virtual. The shared vhdx file provides a shared base from which virtual machines can then be clustered around this shared resource and provide true HA without losing the benefits of resource pools, elasticity, and scalability. Once you have the shared vhdx file in place adn the cluster functional how do you protect the data in the shared vhdx cluster? Veeam Backup & Replication V8 provides direct support for backing up shared vhdx files in a crash consistent state. 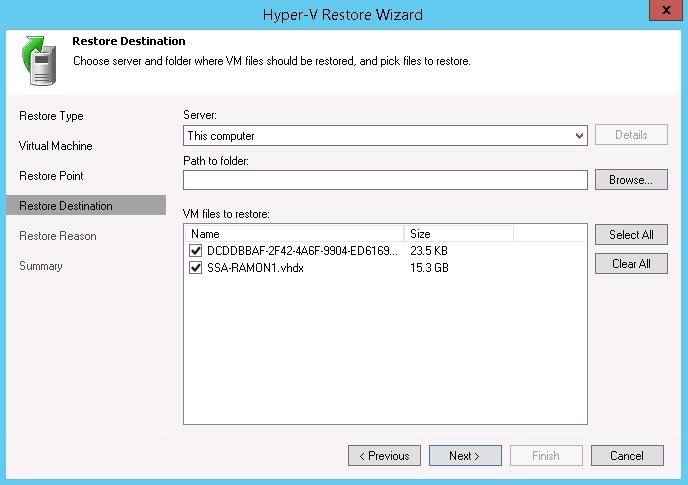 The restore wizard has also been updated to provide full support for full VM recovery of the shared vhdx files. It’s easy to get a crash consistent backup, and if the time should arise when you need a full recovery of that shared .vhdx file Veeam Backup & Replication V8 makes the recovery a snap. Veeam Backup & Replication V8 tackles the complex challenge of backing up differencing vhdx files used in conjunction with multiple virtual machines structured to share a parent virtual disk and then to save all changes that are made to a differencing vhdx disk. This configuration allows for the running of multiple virtual machines that have similar base configurations from a single vhdx file and then each of the individual virtual machines can keep a differenceg disk with all of the changes that make that virtual machine unique from its parent disk. Veeam Backup and Replication V8 has both backup and restore capabilities for differencing vhdx files, and also introduces better performance during backup and recovery of differencing vhdx files on Windows Server 2012 R2. In the world of Windows Server 2012 R2 it is not uncommon to find a Cluster Shared Volume (CSV) that has been encrypted with Microsoft’s Bitlocker Drive Encryption. This is a real challenge when it comes to recognizing changes in the data as they occur and then successfully backing up those changes. Kudos to the R&D team at Veeam. Veeam Backup & Replication V8 can use Changed Block Tracking (CBT) in conjunction with CSV files to effectively and efficiently manage the protection of data even if the CSV is encrypted with Bitlocker. Veeam is doing great things in what I consider "challenging" data protection and availability scenarios with Hyper-V. If you are using Veeam Backup & Replication V8 to protect your data in Hyper-V we would love to hear about your experiences.